(by Ed Adamczyk, UPI and staff reporters at AFP in Karo, North Sumatra, Feb. 19) — Indonesia’s volcanic Mount Sinabung erupted on Monday, sending ash and smoke about 16,000 feet into the air. No one lives inside a previously announced no-go zone around the volcano. But hundreds of houses outside the 4.3 mile danger zone were covered in volcanic ash. No injuries were reported, but officials have distributed face masks and urged local residents and tourists to stay indoors to avoid respiratory problems, said local disaster mitigation agency official Nata Nail Perangin-angin. “In some villages the visibility was barely five metres (16 feet) after the eruption — it was pitch black,” Perangin-angin added. 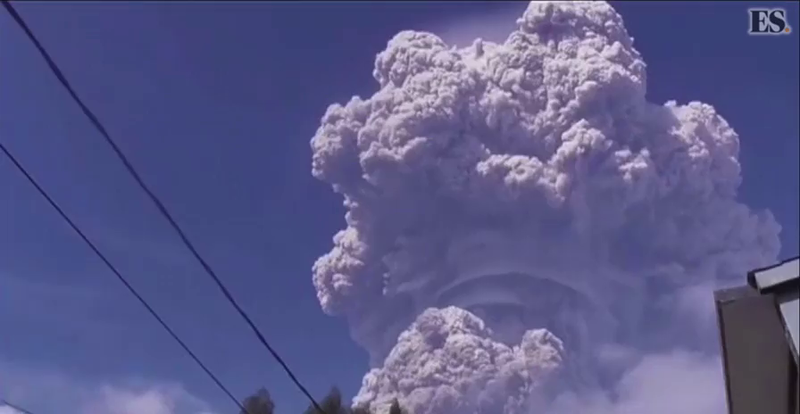 Monday’s eruption lasted for nearly five minutes. Rain is expected in the area on Tuesday and Wednesday, which can combine with ash to make slippery travel conditions and increase the possibility of roof collapses and the volcanic version of mudslides, Accuweather reported on Monday. Wet ash also is capable of conducting electricity, which can lead to power failures. Indonesia is home to around 130 volcanoes due to its position on the “Ring of Fire,” a belt of tectonic plate boundaries circling the Pacific Ocean where frequent seismic activity occurs. Compiled from reports at United Press International (UPI) and Agence France-Presse (AFP). b) Before 2010, when was the last time Mt. 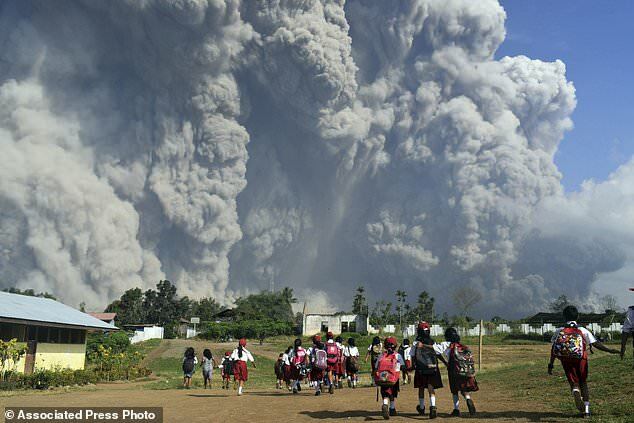 Sinabung erupted? c) No injuries were reported from Monday’s eruption. What negative effects might occur as a result of this latest eruption? d) What is the Ring of Fire? Indonesia is the world’s third-largest democracy, the world’s largest archipelagic state, and home to the world’s largest Muslim population. Indonesia’s approximately 260 million people make it the world’s fourth-most populous nation. The island of Java, roughly the size of New York State, is the most populous island in the world (141 million, 2018 est.) and one of the most densely populated areas in the world. Indonesia includes numerous related but distinct cultural and linguistic groups, many of which are ethnically Malay. Since independence [in 1945], Bahasa Indonesia (the national language, a form of Malay) has spread throughout the archipelago and has become the language of most written communication, education, government, business, and media. Local languages are still important in many areas, however.